This refreshing Grilled Peach Caprese combines grilled peaches, fresh mozzarella, and basil, topped off with a delicious basil lime sauce! Stir balsamic vinegar, lime juice, and ½ cup basil into the sauce and let sit 20 for about minutes. 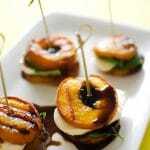 Recipe from Live Eat Learn at https://www.liveeatlearn.com/grilled-peach-caprese/.